Do you get confused if your breakouts are inflammatory or simply purging? Do you know the difference between the two? I used to get frustrated with the “unknown” factor of blemishes coming through in all different sizes and always questioned whether my skin is irritated from something (topical skincare, makeup products or certain triggering foods) or is it finally clearing up and pimples are coming out due to internal cleansing. 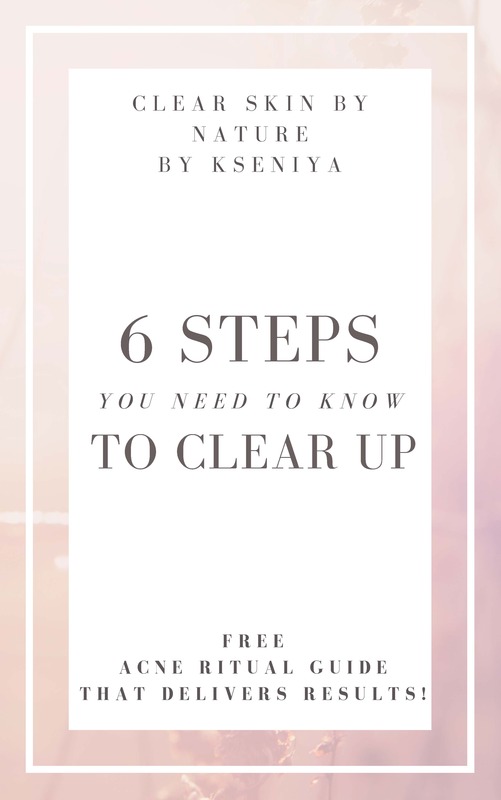 In this post, I’ll cover the major points you’ll want to know based on your acne breakouts and what they’re trying to tell you. I’m going to kick off this topic with the most worst offenders that your skin is seeing, going into the lightest and least concerned type of breakouts. Having acne is a way for your body to tell you something is very wrong when you experience continuing blemishes with no end in sight. 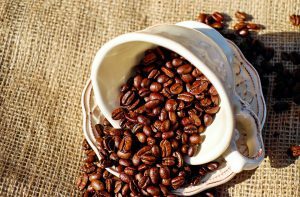 However, specific type of acne is something that I’m going to bring to light in the following paragraphs, describing varieties of acne and what could be driving all those angry pimples. According to dermatology, acne is divided among 2 categories – inflammatory and anti-inflammatory, which I will clarify. In my opinion, ALL forms of acne is inflammatory because obviously not everyone experiences breakouts – many individuals go through life with not one blemish in sight, while others have persistent skin issues, even if its once a month. From the 1st picture (1st from the left), you can see that epidermis (outer skin tissue) has a plugged follicle – meaning, accumulation of extra sebum (skin’s natural oils that go into overdrive when experiencing acne) and keratin sheds (epidermis excess skin – flakiness), which are cells that constantly shed and replaced by cells from the lower layers of the epidermis. When they come together in combination forming a plugged follicle – excess sebum + skin sheds, equates to a pimple forming. The 2nd picture shows how inflammation is starting to take place on the surface of the skin. The bacteria is accumulating and growing along with the help of sebaceous gland (sebaceous glands are usually attached to hair follicles and release a fatty substance, sebum, into the follicular duct and come to surface of the skin). The 3rd picture is the final stage of a pimple that has formed from inflammation pushing through, and as a result becomes irritated and red. 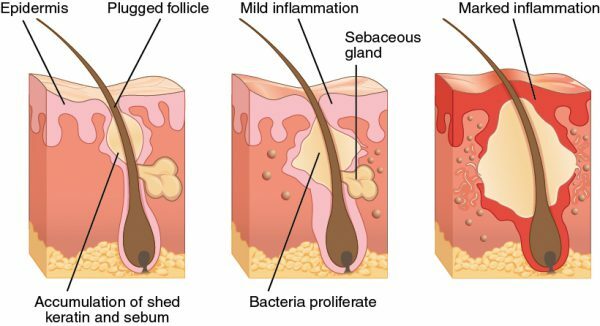 This illustration shows how inflammatory acne and the typical whiteheads form – not rashes or milia, which I’ll get to in a bit. Now, this example only covers how a pimple is created, but doesn’t clarify why acne is formed in the first place. My post here covers more in depth. Cystic + nodular acne are the worst of its kind. Those painful, big, red, swollen pimples just won’t die off – they keep bugging and hurting for weeks on end! Nodular acne tends to be a small bump(s) under the skin. It may be skin toned, but can also turn red as the surrounding area gets more inflamed. It doesn’t have a head like a less severe pimple might. Nodular acne is also painful to the touch. Nodules may persist for weeks or sometimes months at a time, which results in their contents hardening into deep (and stubborn) cysts. On the other hand, cysts, like nodules, occupy deep underneath the skin’s surface. However, because they’re filled with pus, cysts are softer than nodules. Pimples that are cystic acne, burst open – often leading to infection. Acne cysts develop when the contents of blackheads and or whiteheads “spill” into surrounding areas of the skin. In an effort to repair the situation, the body perceives an attack, and the immune system responds by producing pus. Cystic and nodular pimples are commonly seen around the jawline, the mouth and chin area. Of course, they can also come on any area of the face and body. Cystic pimples rise just underneath the skin’s surface and aren’t easily popped/removed/extracted. If you try to extract it, it’ll just get more swollen and the area around it will turn bright red. Cysts can hang around the skin for up to 2 weeks to a month. If you’re lucky, they’ll be gone within 3-5 days. I highly recommend leaving those alone and DON’T PICK – that’s the best advice around those pesky suckers. Cystic acne is linked to hormone imbalance and estrogen dominance. Unfortunately, it can be difficult to treat and can take months to years of agony to find a solution if an individual is clueless on where to start (which, most of us are!). 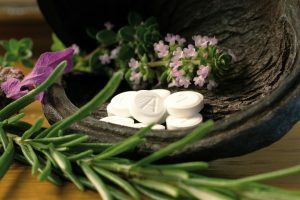 So, what are some known health issues that are connected to hormone imbalance + estrogen dominance? PCOS is a common hormonal disorder among women, which can develop at a young age of 11 – it causes enlarged ovaries with small cysts on the outer edges. Symptoms of PCOS include menstrual irregularity, excess hair growth, acne, and obesity. Since PCOS is a hormonal health problem, hormonal acne (cystic) can become a side effect. Getting off birth control pill can result in tipping off the hormones, which effects the skin with those large, painful pimples that are seen. This is quite common among women who try to come off the pill and balance hormones to a healthy medium, which can take up to 6 months – sometimes more. However, getting on the pill sometimes triggers this effect as well because consuming synthetic hormones screws with natural human hormones and results in unwelcome change to the skin. Body freaks out either way (getting on or off BCP) and one of the ways it tells you that something is wrong is through breaking out – unfortunately, the case is hormonal acne. Certain herbs and a healthy nutrition is my preferred solution on getting off BCP in order to balance hormones to a healthy state. This will, of course, eliminate cystic acne. Hormone changes can occur at any time during one’s lifetime and is usually a cause of stress, not enough oxygen to skin (lacking exercise), poor diet, etc. There could be a host of health problems due to hormonal shift, especially in women, such as endometriosis, uterine fibroids, ovarian cysts, adenomyosis, etc. Generally speaking, hormone imbalance is tricky to treat because it’s a form of estrogen dominance for most (could be progesterone) and the body must sustain and balance w/ progesterone in order to avoid internal (female’s reproductive problems) + external health issues (acne, skin problems). Acneic type looking rash can sneak up on any part of the body, besides from the obvious – face. It usually comes in a form of a cluster on an area of the skin and the zits tend to be tiny – sometimes come to a white head, and other times just linger in a red-looking patch. Rash type acne is usually always linked to some food allergy or food sensitivity. You can read more about it here from my previous post. Rash can sometimes develop if too many supplements/vitamins are consumed – or worse, if you don’t need to supplement with a specific mineral but are told to do so and results in a rash reaction. For example, if you decided to take up iron supplements because you read somewhere that they ease menstrual cramps and fatigue during that time of the month – but, your body is already getting enough of it through daily food consumption – you could get a body/acne type rash because your body doesn’t need more of it. 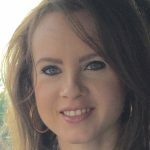 My esthetician, who’s had more than 20 years of experience, pointed this out to me about her clientele – in general terms, per supplementation intake – not limited to iron. Are you feeding your body healthy foods + nutrients? Simple questions to ask yourself when you notice something off inside you or on you…skin changes, rash, darkening of the skin, etc. Of course, sometimes a more serious health issue could be in play and medical assistance is needed. But learn to hone in and pay attention to your body – it’s living + beautiful and has capabilities to cure and repair itself if proper care is given. Acneic rash if gone untreated, lingers on the skin for months at a time. Milia is an odd type of breakout – it’s a tiny, hard, looking pimple that needs a professional to be extracted. A knowledgeable esthetician can do the job (my esthetician can ;)) or a visit to a dermatologist office may alleviate milias. Milia may appear like acne, it’s a cross between a rash and tiny whiteheads. They tend to be embedded into the skin and are keratin filled spots that form beneath the skin’s surface. Unlike acne, milia are cysts, they don’t form from a pore and usually don’t get inflamed or develop redness or swelling. Milia tends to form especially around the eye area – also, forehead and nose area. Babies/newborns tend to sometimes get milia, which does rise up an interesting curiosity. 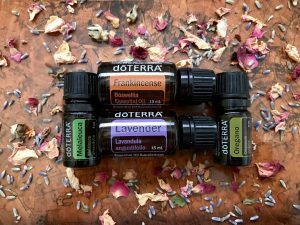 There’s a lot of difference responses to why milia forms, but according to my holistic esthetician who’s had 20+ years of experience in the business, states that it goes back to the diet. I suspect that they form because of too much protein in one’s diet. Why? Milia are made up of keratin and keratin is a type of protein – since, regular acne is inflammation (something is going on internally and purging acne unto the skin), then I can assume that consuming too much protein would cause for milia to purge unto the skin. Again, this is only my assumed suspicion + opinion. Keep in mind that milia can go away on its own – not always, but it does clear up. Again, unknown factor – but my suspicion is diet. Lastly, do not try to squeeze/ remove milia on your own. Since they’re such hard, deep bumps, you may end up scarring the skin. Leave it to a professional to do the job. As stated above, a knowledgeable esthetician can remove milias with a tiny needle. Dermatologist visit is another option. They’ll prescribe some kind of topical to use daily. If that doesn’t work, then a comedone extractor or lancing tool is used to extract. The regular acne contributors – blackheads + whiteheads. Individuals suffering from acne have blackheads, which develop where blocked oil and skin cells oxidize, turning black. However, even peeps who don’t have acne will still get blackheads if no proper exfoliation or cleansing is maintained throughout the week. Whiteheads are defined into 2 categories – papules (small, solid bumps that appear a little red and inflamed – no pus) and pustules (whiteheads contain nonbacterial pus). They form when there’s an increase in oil production – diet and lifestyle are 2 contributing factors. They sometimes form in a red shaped pimple – sometimes a little painful – almost like a cyst type, but not quite as large. After a day or two, it’ll come to a head. Other times, a whitehead will just pop up out of nowhere. Leaving those suckers alone is my best advice – picking them, especially if they form daily, can result in scarring of the skin. Although, picking at cystic acne is more likely THE culprit to acne scars, because those are very deep rooted pimples. And unfortunately, resurfacing acne scars can take years! For some, they are a lifelong problem. 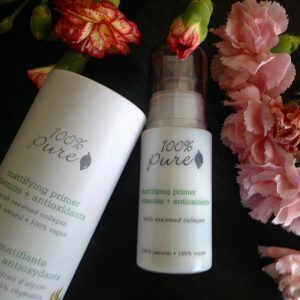 Purging, which is essentially a detox phase that naturally happens when your skin is pushing all the buildup of toxins internally to the external part of your skin – your face. Purging is a process of consistent tiny, whiteheads coming forth – It can also look like a form of a rash as well. This “detox” could last anywhere from a couple of days to a month. Sometimes, it could take a couple of months- everyone is different (but rule of thumb to the detox phase is a couple of days to 3 weeks)! Personally, it took me 2 whole months of detoxing to see my skin calm down, once I switched to holistic health practices of healing, nurturing food + supplements + lifestyle changes. But then again, I had acne for 18 years, so no wonder it took me that long to detox my internal body from all that toxicity. When you switch to all-natural skincare products (rich in botanicals, essential oils, clays, herbs) that are naturally, not chemically derived, purging usually always happens (if your skin agrees w/ the products, that is). How can you tell if skin is purging (not regular breakouts)? In addition, after the purging/ detox phase (lasts a few days to a couple of weeks), the pimples that kept popping up in random places (ex. If you don’t usually break out in the forehead region and they magically appear) will gradually clear away and STAY away as you continue with your new skincare + healthy holistic habits – this is the biggest difference between skin purging and breakouts. You will notice more acne initially, but these are stored, internal toxins that are making their way to the surface. As stated previously, these new skincare + healthy holistic habits are simply clearing out dirt and bacteria + cleansing inflammation and paving the way for clear, glowing skin! Keep in mind, regular acne consists of blemishes that occur on a regular basis, and are a result of hormonal imbalance, stress, poor diet, etc. Most conventional acne skincare topicals, which contain benzyl peroxide, salicylic acid, glycolic acid, and sulfur will only work as a band aid to cover up acne problems without getting to the root of the problem. I hope this wraps up and clarifies for you the “types of breakouts and what they stand for.” From my own experience, I understand how mentally confusing and exhausting it is to try differentiating breakouts. Some are just annoying, while others are painful and take forever to clear away. However, I hope this post has guided you to understand your skin and hopefully make certain adjustments to your health practices. Please keep in mind, acne is always skin deep. Has acne frustrated you with all the different “types” of breakouts you’ve been seeing? Share below! My acne is a tough one, as you say, because it’s hormonal and only pops up in specific patches when I’m ovulating or on my period. Otherwise, I have perfectly clear skin. I also have endometriosis and hypothyroidism, which both play a part in throwing my hormones out of balance. It was better on birth control, but since I came off while trying to get pregnant it all came back. Other than hormone adjustments, is there anything that you know of that can bring relief? I suffered from acne ALL growing up and faced the consequences simply because there was nothing that worked. Eventually as I grew older it began to go away and now it has gone for good (although I hope so). If only I knew what the causes were years ago then maybe I could have got rid of it earlier! You are going to help so much people with this article so great job. Acne is terribly frustrating! I get it! Many peeps seem to outgrow acne, especially if it came during the younger, teenage years. Many teens get acne due to hormone shift, and after a year or two, or three – BAM, no more acne. Its definitely more trickier + complicated when adults get acne and that’s where I learned through “trial & error” of what works and what doesn’t. Every person is unique and acne isn’t always the same for everyone. I’m glad you outgrew yours, though! When I was in high school I had nasty acne and even now in my mid thirties still suffer from breakouts from time to time. I found that the best way to help control my own (which was 99% whiteheads) was to use a very very light peroxide gel as opposed to the washes you could get from the doctor’s office. This, once a day, plus an oil free moisturizer really helped control my acne extensively. I hope everyone else has good luck controlling their own, I know it is incredibly frustrating! I had bad acne in high school too, so I know the frustration that one has to endure during those early years. Sorry to hear that acne is still plaguing you into your 30’s – bummer. But, I’m glad you’ve found something that works! 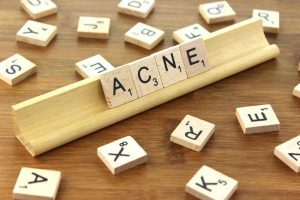 If for whatever reason, the topical you’re currently using stops working – read some of my blog posts on why acne forms in adults and the things you can start doing. It’ll help, as topicals mostly act as a band aid for acne, especially when someone is suffering from it into adulthood. 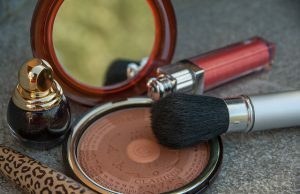 Previous Previous post: Are Makeup Primers Clogging Your Pores (Silicone Alternatives Revealed)?